Japan's Prime Minister Shinzo Abe (L) joins African leaders for a group photograph during the Sixth Tokyo International Conference on African Development (TICAD VI) in Kenya's capital Nairobi (August 27, 2016). Tokyo steps up its commitment to the continent at the Tokyo International Conference on African Development. Since its inception 20 years, the Japan-led Tokyo International Conference on African Development (TICAD) has always been held in Tokyo. This past weekend, the sixth TICAD was held in Nairobi, the capital of Kenya. It is a symbolic move, physically bringing Japanese leadership to a continent in which Japan has lagged behind its rival, China. On Saturday, Japanese Prime Minister Shinzo Abe announced that Japan would commit $30 billion in public and private support for infrastructure development in Africa. This is in addition to the $32 billion that Japan pledged at the last TICAD in 2013. Japan is motivated to strengthen economic ties with African countries because of its own resource scarcity as a small island nation. 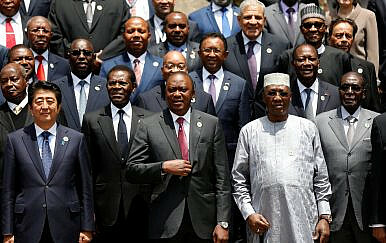 At TICAD, Abe and African leaders discussed diversifying African economies, moving toward industrialization, creating jobs for women and youth, improving health care, and continuing the fight against terrorism. Though Abe’s trip was focused mostly on the economic dimension, African countries’ importance to Japan’s geopolitical designs was also highlighted. African countries have been and continue to be important to Japan because their support is critical to accomplishing UN Security Council reform – and fulfilling Japan’s long-cherished dream of becoming a permanent member. Toward this goal of improving relations with African countries, Japan’s Ministry of Foreign Affairs recently revealed a plan to establish a mission to the African Union (AU) and assign an ambassador there. The AU has over 50 members, making it a significant voting bloc in the UN General Assembly. As Asahi Shimbun points out, there is a disparity in Japanese and Chinese giving: according to the Japan External Trade Organization, Japan’s overall direct investment in Africa totaled $1.5 billion in 2014, and $1.24 billion in 2015. In comparison, China made a single investment of $2 billion in Equatorial Guinea in just one month (April 2015). Though African countries are not traditionally the loudest voices when it comes to upholding international maritime norms, Abe clearly wants to change that. Addressing Japan’s paramount concerns about Chinese activities in the East and South China Sea, the Nairobi Declaration noted: “We stress the importance of promoting regional and international efforts related to maritime security, including piracy, illegal fishing, and other maritime crimes, maintaining a rules-based maritime order in accordance with the principles of international law.” This circuitous criticism of China is notable, especially considering how much China has already invested in Africa. In a separate meeting from TICAD, Abe met with Djibouti President Ismail Omar Guelleh and thanked the country for its continued support of Japanese Self-Defense Force personnel dispatched there on a counterpiracy mission. Abe and Guelleh also agreed on the importance of freedom of navigation – which, given the geography, could simply be a reference to Somali pirates, but could also be another subtle rebuke of China. Djibouti is important to Japan as the home to Japan’s first full-scale overseas facility, launched in 2011. Newly appointed defense minister Tomomi Inada visited the African outpost less than two weeks ago. China is also constructing its first oversea military facility in Djibouti. A Rising Sun Over the Antilles: Japan’s New Era of Caribbean InvestmentAfter Dhaka Attack Claims 7 Japanese Lives, Tokyo Steps up CounterterrorismJapan Inc. Looks Abroad for DemandUS-Japan Trade Agreement Negotiations: Why Now?Is Japan Anti-China?